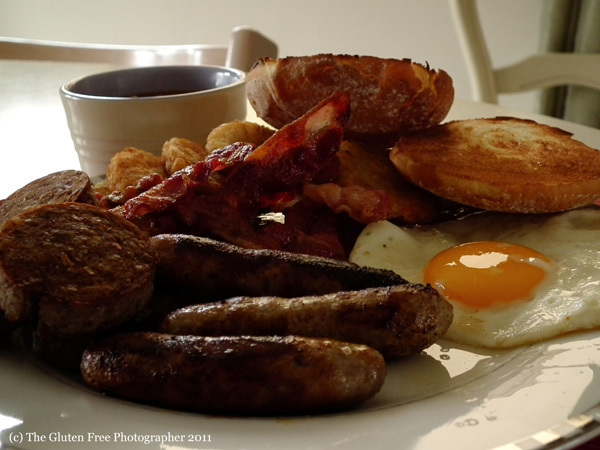 I enjoy a good fry-up every now and then and with needing gluten free food comes the usual ingredients difficulty. So I thought I'd share my favourite brands I use for a decent full Irish breakfast. When I plate-up I like to see beans, sausages, bacon, egg, toast, white pudding and hash browns. Of course no fry is complete without tea and I like to have a mug of Barry's with mine. For the sausages, I used Jane Russell's Bratwurst, just for a change. Really nomsome. There are quite a few gluten free sausages on the market at the moment. My favourites being the Clonakilty gluten free sausages and Marks & Spencer's sausages (the majority of the M&S range of sausages are already gluten free). You can also get Hodgins brand and Superquinn brand gluten free sausages too, if you're interested. The beans are Heinz and my secret to make them particularly delicious is a half a teaspoon of Molasses. 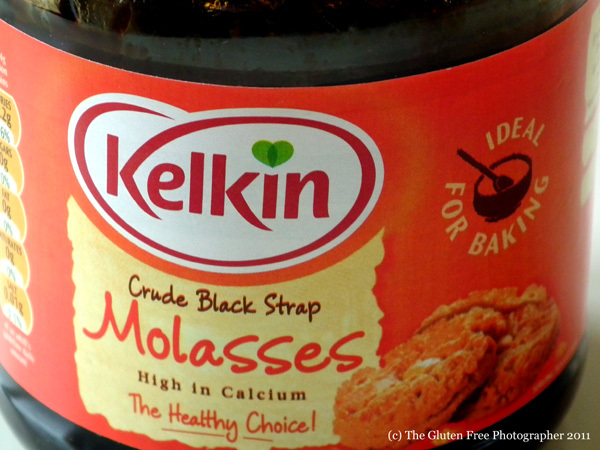 I use the Kelkin brand. It gives the beans an extra depth of flavour. Not only that, but it adds that extra crucial iron I particularly need in my diet. Head to Marks & Spencer for the hash browns. 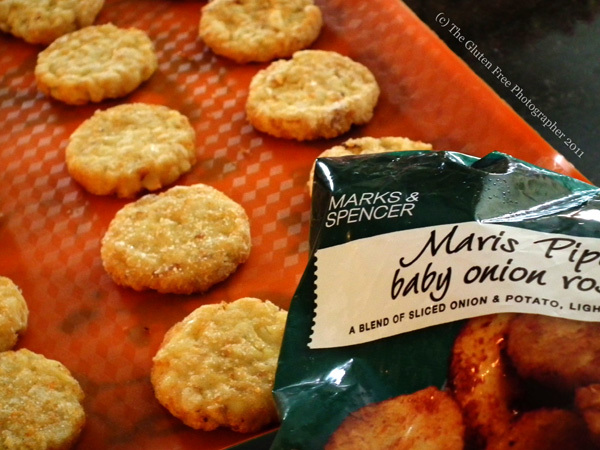 I use their maris piper potato rostis that are utterly delicious and gluten free to boot. 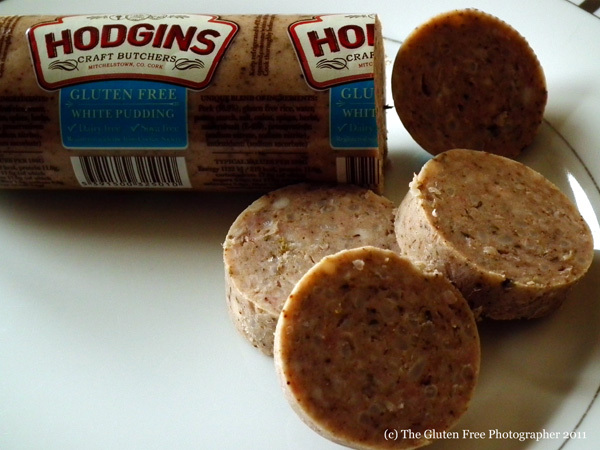 For the white pudding I use the Hodgins brand. I think it tastes perfect. They have a black pudding too, but I've never really been a fan of black pud, so I don't bother with it. Super Valu are the main distributor for this Cork-based brand. I'm sure some of the larger supermarkets also supply them. In my most recent breakfast feast, I used the Juvela white rolls for toast, which I think are pretty decent gluten free bread fare. The majority of the ingredients you can keep handy in your freezer, for those all-important emergency rations. Nice. Gluten free food has never tasted so good - even my non-coeliac husband enjoys the gluten free fry up! Of course, this isn't something you'd treat yourself to too often, but it is nice to have the luxury of a decent full Irish every now and then, without the glutened hassle. 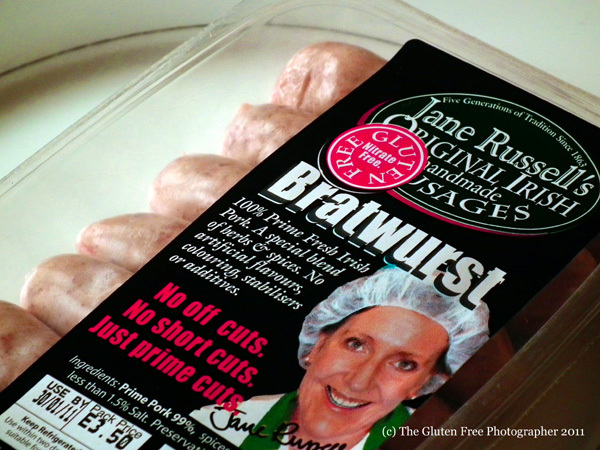 I love the Jane Russell sausages, seriously nom!